Ranulf, the Speican lord, is dead, and Arnhem is save, or so the Arnhemians believe. Sir Geoffrey and his companions have just completed a mission for Queen Aislinn when he receives word of the Speicans attacking Arnhem. Geoffrey and his party, which now includes exile Jenanna, split up and rush to different kingdoms to ask for aid. 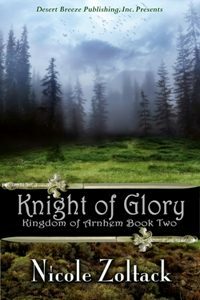 Even as he fights for his kingdom and his life, Geoffrey finds himself torn between his new friend Jenanna and the mysterious lady Celestia he left behind in Arnhem. Enlisting help is infinitely more difficult than they anticipated and to make matters worse, rumors about that the Speicans have enlisted a mage of their own, to work unspeakable, forbidden magic. The war between Speica and Arnhem has just begun. Will Geoffrey survive the battle to live another day and discover which woman he truly loves?